Save up to 20% per charter! Join Enchante in Salles d'Aude then visit a local olive press to sample the famous Lucques olives. Discover the magnificent Benedictine Abbey nestled in the picturesque village of Lagrasse, see the sights of the Roman Mediterranean capital of Narbonne and descend the iconic locks of the Canal du Midi. Explore the wine region of Minervois and cruise to the medieval fortified city of Carcassonne with its impressive watchtowers and portcullis. Spacious and modern, Enchante is a luxurious and well-appointed Hotel Barge accommodating 8 guests in four sumptuous suites. She has a large dining room, internet access, and a generous sun deck with a spa pool. On board are a crew of four comprising the captain, a Master Chef, Tour Guide and housekeeper who are on hand to ensure your holiday is a memorable one. Bicycles are available for exploring independently. 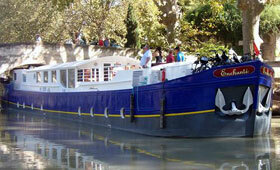 Guests are met in Narbonne and transferred by private chauffeured minibus to Enchanté. A champagne welcome and an introduction to the Captain and crew, followed by dinner on board. Morning cruise along the Grand Bief, a technological achievement unique to the Canal du Midi to link Narbonne to the Mediterranean, to the charming historical village of Roubia. Afternoon excursion to “L’Oulibo”, a local co-operative olive oil press where we will sample the famous Lucques olives. We continue on to Minerve, the ancient capital of the Minervois, which boasts a 12th-century Cathar fort surrounded by deep limestone gorges. Besieged by Simon de Montfort in 1210, its hilltop location affords spectacular views. Dinner on board. After breakfast, our excursion is to Narbonne, a Roman Mediterranean capital where the Visigoth monarchs once lived. Enjoy a visit to the Archbishop’s Palace, Roman Horreum and the indoor market at the hub of this bustling canalside town, where you will have time to shop or simply absorb the lively atmosphere. Afternoon cruise past vineyards and pine trees to Homps. This picturesque mooring in the heart of a French village presents a perfect opportunity to try your hand at a game of boules, followed by an alfresco dinner on board. This morning we visit a Benedictine Abbey founded in the 8th century. Nestled in Lagrasse, a village awarded the title of “Plus beaux villages de France” and home to many artisans who have set up workshops in the medieval centre, the restored Abbey was once one of the most prosperous thanks to Charlemagne’s charter. Then we sample some local cuisine with lunch ashore in a spectacular setting overlooking the Corbieres vineyards, before returning to the barge to cruise to Puicheric, past “l’Epanchoir”, one of the bridges invented by Pierre Paul Riquet for the Canal du Midi. Dinner on board. Today we cruise along the 330-year-old canal ascending its trademark locks as the relief becomes steeper. This is a great opportunity to walk or cycle from one lock to the next as Enchanté cruises on, navigating the triple locking system. The afternoon excursion is a wine tour and tasting at Château Saint Jacques d’Albas in Minervois, one of the few regions to receive the much-envied French mark of approval for wines known as A.O.C. (Appellation d’Origine Controlée). This informative tour offers an opportunity to sample wine in situ and find out more about the Languedoc’s long-standing and continuing wine trade. Dinner on board. Fascinating morning tour of Carcassonne. Dating back to the Gallo-Roman era, this is the most complete medieval fortified city in existence today with its 52 watchtowers, portcullis and extraordinary repertoire of defences, which resisted the many armies that tried to storm this glorious Camelot setting. This afternoon we squeeze through tight bridges and glide past picturesque vineyards and hamlets to Trèbes. Once a major ally to Carcassonne, this medieval town still retains unique paintings within its 13th-century church. Farewell Dinner on board. PLEASE NOTE: On alternate weeks the cruise runs in the reverse direction. This is a sample itinerary and is subject to change.